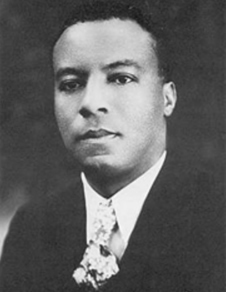 Asa Philip Randolph (1889-1979) was born in Crescent City, Florida, and grew up in Jacksonville. Brought up to value education, he attended high school at the Cookman Institute where he studied Greek and Latin and excelled in drama and public speaking. Randolph was also brought up to take pride in his heritage and his abilities. He and his brother "never felt we were inferior to any white boy, never had that concept at all," he remembered, "and we were told, constantly and continuously that 'You . . . are not supposed to bow and take a back seat for anybody.'" Graduating at the top of his class in 1907, Randolph began working for the Union Life Insurance Co. Although it was a well-respected job in the black community at the time, it did not hold Randolph's interest -- and neither did a series of odd jobs he tried after that. Inspired by W.E.B Du Bois 's book, The Souls of Black Folk and its critique of racism, Randolph was determined to get out of the South. In 1911 he found work on a steamboat headed for New York City. Settling in Harlem, Randolph found work as switchboard operator in an apartment building, enrolled in the College of the City of New York (where he discovered Karl Marx), and helped organize the Independent Political Council, a debate group. A member of the Socialist party by 1916, and a popular street-corner orator, Randolph got a job doing political work for the Brotherhood of Labor, an employment office for African American migrants from the South and West Indian immigrants. In 1917 his career as an organizer and activist took off when he and Chandler Owen, a longtime associate, launchedThe Messenger, a monthly magazine that delved into politics, trade union news, and literary criticism, among other subjects. As editor, Randolph campaigned against lynching, U.S. participation in the First World War, and the segregation he witnessed in the trade union movement. In fact in 1919 he denounced the AFL as "the most wicked machine for the propagation of race prejudice in the country." Because he believed black Americans would never gain political freedom without economic power, in 1918 Randolph helped organize the National Association for the Promotion of Labor Unionism Among Negroes. He also supported the National Brotherhood of the Workers an independent union organized in 1919 that combined black nationalism with trade unionism. Impressed by Randolph's abilities, a group of Pullman porters invited him in 1925 to help organize their fledgling union, The Brotherhood of Sleeping Car Porters. Although it would take ten years for the Brotherhood to gain an AFL charter -- the first awarded to a union of black workers -- in 1937 the Brotherhood of Sleeping Car Porters would become the first black union to win a collective bargaining agreements.